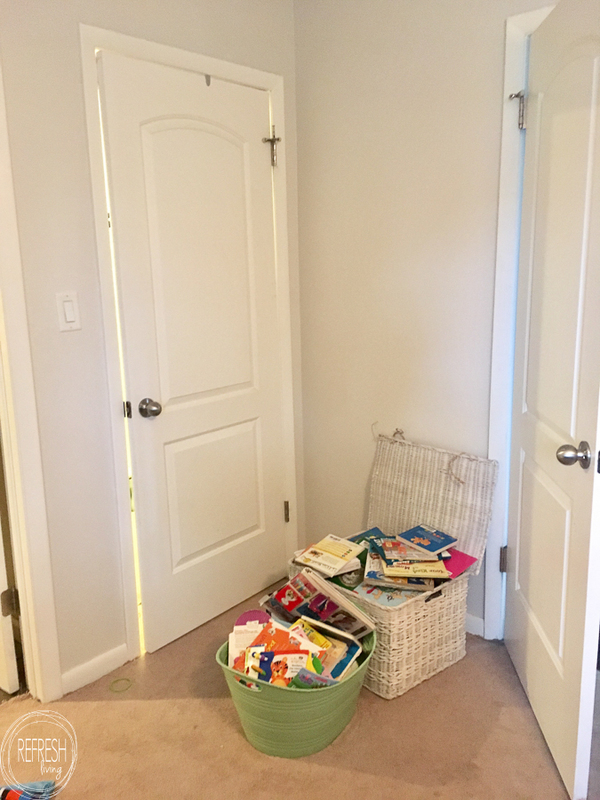 It’s One Room Challenge time, and I’m back and ready to overhaul our boring nursery. We recently had our third daughter back in December, and our nursery has more or less been the same for all three of our girls. Let me give you a fun little history lesson on this room. For the first five years of living in our home this room was our bedroom. It has a bathroom connected to it, so we made it our master bedroom (even though there are was bigger bedroom with a bigger closet). After we found out we were pregnant with our first baby, I got the renovation bug and knocked down a wall of that aforementioned bathroom to make it a Jack-and-Jill-ish bathroom. 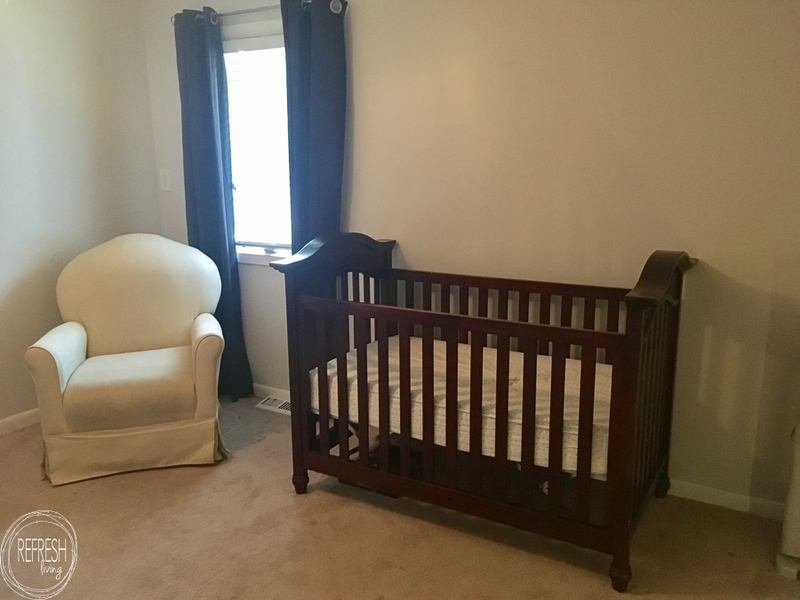 We moved into the other larger bedroom and made this room into a nursery. That was five years ago, and since we don’t usually find out the gender of our babies, I tried to design a gender neutral room, but really just ended up with yellow walls and some frog accents here and there. The room has since been painted, but everything else has basically stayed the same. Dark furniture, dirty carpet, bare walls, and no real organization. Being an educator, and a lover of all things vintage, I thought I’d put those two passions together to create the design for this new, not so boring, nursery. 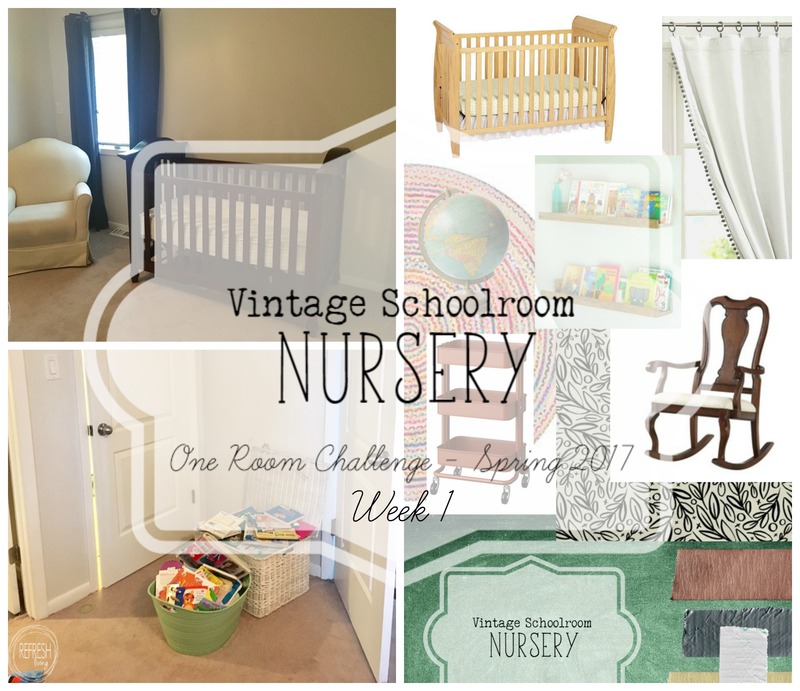 Take a look at a modern spin on a vintage classroom – nursery style! I’ve been collecting ideas and vintage goodies for this space for the last few months (yep, I’ve been dreaming up this nursery for over a year – ever since I got pregnant). I can’t wait to paint an entire wall with vintage green chalkboard paint! I’ve used it in my home for smaller projects, but I’m so excited for it to cover an entire wall! 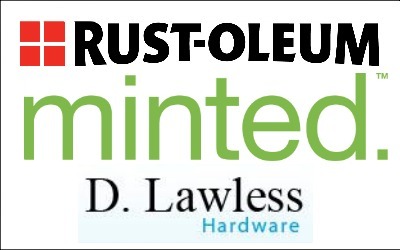 I can’t wait to use some awesome products from my sponsors for this room overhaul! Six weeks always fly by during these challenges, so I’m really going to make it my goal to work on projects during the first couple of weeks rather than waiting until the end. I hate to admit this, but I’ve never actually completely finished everything I wanted to in any of the rooms I’ve worked on for the ORC. I’m planning for this one to be the exception! Be sure to head on over to Calling It Home to see all the other One Room Challenge participants! I love green chalkboards so much! Can’t wait to see this room! Thanks, Emy! I can’t wait to put that green chalkboard on the wall! Aw, I love nursery makeovers! And especially ones with a unique theme! Cannot wait to see how it progresses, Jenny! Thanks, Bre! I’m excited to get started! I love your design plan! The green chalkboard wall will be a huge hit! And I’m a huge fan of the bright and colorful rug. Can’t wait to follow along! That rug is AMAZING! Also, good choice on the cart – my parents have one at their house and it is literally so convenient for a nursery (I store our diaper/change stuff on it when I visit). Good luck ! You had me at “vintage schoolroom”, Jenny! What an adorable theme! Excited to see it come to life!! Thanks! We all need all the positive energy we can get to finish these rooms, right?! Congrats on your baby! 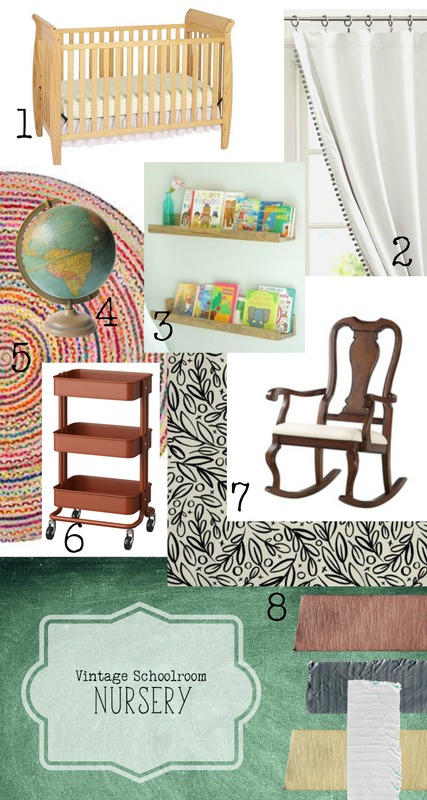 I always love Nursery makeovers, so I’m excited to follow along.